Benetton, the Italian fashion line known for provocative marketing campaigns advocating progressive causes, has denied any ties to the garment factory in Savar, Bangladesh, that collapsed last week, killing at least 377 people. “None of the companies involved are suppliers to Benetton Group or any of its brands,” the company said on April 24. New Wave Bottoms, one of the manufacturers based at Rana Plaza, lists Benetton as a client. 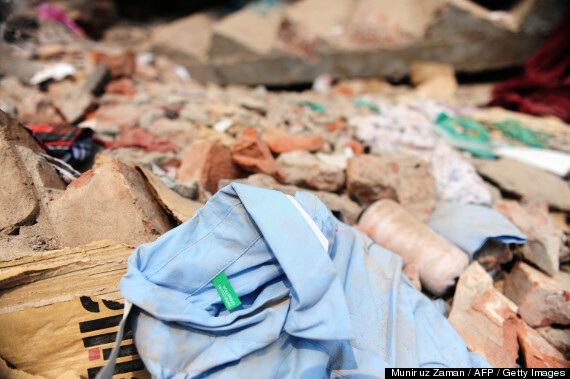 Labor rights activists digging through the debris have also said they founddocuments linking Benetton to the factory. Benetton is hardly the only—or even the largest—clothing company with ties to the factory; America’s Wal-Mart, Ireland’s Primark, and Canada’s Joe Fresh all made clothing there. But Benetton’s initial denial and its social activism could make it a bigger target for criticism. The company produces most of its clothing in Bangladesh, which is the world’s second-largest garment exporter, after China. Workers in garment factories like the one that collapsed last week make a minimum wage of 3,000 taka ($38) a month. Working conditions are notoriously brutal and unsafe. The day before Rana Plaza collapsed, large cracks appeared in the side of the building, prompting a bank and other retail stores on the first floor to close. But the garment factories in the floors above stayed open, and the building fell to pieces the next day. The death toll now stands at 377 but is expected to keep rising. The building’s owner, Sohel Rana, was arrested on Sunday by Bangladeshi paramilitary forces as he attempted to cross the border into India.